Military leadership in the American Civil War was influenced by professional military education and the hard-earned pragmatism of command experience. 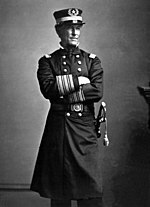 While not all leaders had formal military training, the United States Military Academy at West Point, New York and the United States Naval Academy at Annapolis created dedicated cadres of professional officers whose understanding of military science had profound effect on the conduct of the American Civil War and whose lasting legacy helped forge the traditions of the modern U.S. officer corps of all service branches. President Abraham Lincoln was Commander-in-Chief of the Union armed forces throughout the conflict; after his April 14, 1865 assassination, Vice President Andrew Johnson became the nation's chief executive. 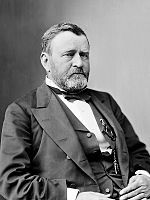 Lincoln's first Secretary of War was Simon Cameron; Edwin M. Stanton was confirmed to replace Cameron in January 1862. Thomas A. Scott was Assistant Secretary of War. Gideon Welles was Secretary of the Navy, aided by Assistant Secretary of the Navy Gustavus Fox. When the war began, the American standing army or "Regular army" consisted of only 1080 commissioned officers and 15,000 enlisted men. Although 142 regular officers became Union generals during the war, most remained "frozen" in their regular units. That stated, most of the major Union wartime commanders had significant previous regular army experience. 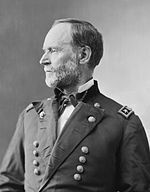 Over the course of the war, the Commanding General of the United States Army was, in order of service, Winfield Scott, George B. McClellan, Henry Halleck, and finally, Ulysses S. Grant. 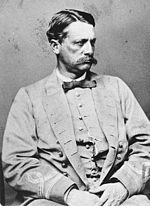 2 Major General George B. McClellan November 1, 1861 - March 11, 1862 Commanded the Army of the Potomac in addition to serving as Commanding General. 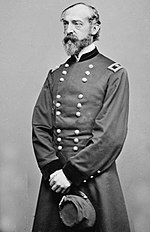 Relieved of duty as Commanding General on March 11, 1862. Under the United States Constitution, each state recruited, trained, equipped, and maintained local militia; regimental officers were appointed and promoted by state governors. After states answered Lincoln's April 15, 1861, ninety-day call for 75,000 volunteer soldiers, most Union states' regiments and batteries became known as "Volunteers" to distinguish between state and regular army units. Union brigade-level officers (generals) could receive two different types of Federal commissions: U.S. Army or U.S. Volunteers (ex: Major General, U.S.A. as opposed to Major General, U.S.V.). 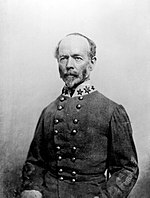 While most Civil War generals held volunteer or brevet rank, many generals held both types of commission; regular rank was considered superior. Reflecting the multi-national makeup of the soldiers engaged, some Union military leaders derived from nations other than the United States. The rapid rise of the United States Navy during the Civil War contributed enormously to the North's ability to effectively blockade ports and Confederate shipping from quite early in the conflict. Handicapped by an aging 90 ship fleet, and despite significant manpower losses to the Confederate Navy after secession, a massive ship construction campaign embracing technological innovations from civil engineer James Buchanan Eads and naval engineers like Benjamin F. Isherwood and John Ericsson, along with four years' daily experience with modern naval conflict put the U. S. Navy onto a path which has led to today's world naval dominance. 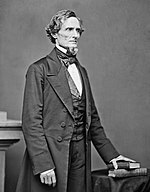 Jefferson Davis was named provisional president on February 9, 1861, and assumed similar commander-in-chief responsibilities as would Lincoln; on November 6, 1861 Davis was elected President of the Confederate States of America under the Confederate Constitution. Alexander H. Stephens was appointed as Vice President of the Confederate States of America on February 18, 1861, and later assumed identical vice presidential responsibilities as Hannibal Hamlin did. 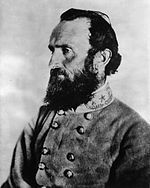 Several men served the Confederacy as Secretary of War, including Leroy Pope Walker, Judah P. Benjamin, George W. Randolph, James Seddon, and John C. Breckinridge. 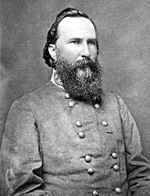 Stephen Mallory was Confederate Secretary of the Navy throughout the conflict. In the wake of secession, many regular officers felt they could not betray loyalty to their home state, as a result some 313 of those officers resigned their commission and in many cases took up arms for the Confederate Army. Himself a graduate of West Point and a former regular officer, Confederate President Jefferson Davis highly prized these valuable recruits to the cause and saw that former regular officers were given positions of authority and responsibility. The land of Davy Crockett and Andrew Jackson, the state military tradition was especially strong in southern states, some of which were until recently frontier areas. Several significant Confederate military leaders emerged from state unit commands. 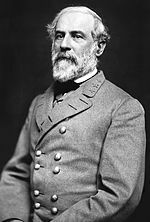 While no foreign power sent troops or commanders directly to assist the Confederate States, some leaders derived from countries other than the United States. The Confederate Navy possessed no extensive shipbuilding facilities; instead, it relied on refitting captured ships or purchased warships from Great Britain. The South had abundant navigable inland waterways, but after the Union built a vast fleet of gunboats, they soon dominated the Mississippi, Tennessee, Cumberland, Red and other rivers, rendering those waterways almost useless to the Confederacy. Confederates did seize several Union Navy vessels in harbor after secession and converted a few into ironclads, like the CSS Virginia. Blockade runners were built and operated by British naval interests, although by late in the war the C.S. Navy operated some. A few new vessels were built or purchased in Britain, notably the CSS Shenandoah and the CSS Alabama. These warships acted as raiders, wreaking havoc with commercial shipping. Aggrieved by these losses, in 1871 the U.S. government was awarded damages from Great Britain in the Alabama Claims. ^ "The Belligerent Rights of the Rebels at an End. All Nations Warned Against Harboring Their Privateers. If They Do Their Ships Will be Excluded from Our Ports. Restoration of Law in the State of Virginia. The Machinery of Government to be Put in Motion There". The New York Times. Associated Press. May 10, 1865. Retrieved December 23, 2013. This page was last edited on 7 January 2019, at 16:11 (UTC).